Após o embarque no seu hotel no Rio, viaje até o ponto de embarque para embarcar no seu barco. Saia das margens urbanas do Rio para explorar as vistas da água, incluindo diferentes vistas da estátua do Cristo Redentor, de Copacabana e do Pão de Açúcar. Veja os bairros históricos de Botafogo, Urca e Flamengo enquanto navega pela Ilha Flagstone. Navegue sob a Ponte Rio-Niterói e veja as praias de Niterói, Fortaleza São João e Fortaleza Santa Cruz. Termine seu cruzeiro de meio dia aqui ou faça um upgrade para incluir um autêntico almoço de churrasco brasileiro em um restaurante local do Rio, incluindo várias opções de acompanhamentos e diferentes cortes de carne, além de opções vegetarianas. A duração do cruzeiro é de 2 horas e o tempo total do passeio é de 4 horas. The Tour Guide was not really needed as their was one on boat. A lovely afternoon in the harbour - great to do if you have a couple of hours to spare, but not mind blowing. Scenery was good and luckily the weather was amazing! Muy amable la guía turística. Muy atenta a brindar información. It’s amazing tour! Our tour guide, ian did a great job! He very kind and helpful. definitely recommend! The guide was informative and was clear in the explanations. It was unique to see some of the sights of Rio that you wouldn't normally see. Overall the boat ride was relaxing, although a bit boring. Most everyone on board didn't say anything and really wasn't all that excited. I would recommend that is needs more energy from the guide on board and crew. I'm not talking about a party boat but just to give it some excitement. Also, instead of serving cut fruit, serve other items as many people were hesitant to try open fruit watermelon and pineapple. What a lovely day we had, the water was fantastic and the views of the city and surrounding landscape from the water is breathtaking. The history and landmarks were described in detail and the lunch provided afterwards was delicious. Highly recommended. El paseo muy lindo y puntual, nuestro Guia Joan Bautista jb Excelente profesional. Al almuerzo nos recibió y acompaño el sr Luis. al restaurante de la plaza de ipanema. CARRETAO. Grande fue nuestra sorpresa al aparecer en el Restaurante una rata de tamaño enorme en la decoracion que hay sobre la comida. El manager del lugar no pidio disculpas, no dio explicación y nos cobro la cuenta como si nada hubiera pasado. y mucho menos atino a tener una atencion a modo de disculpa. We chose to not get the seafood lunch and since our flight out of Rio was scheduled for later in the day, we were anxious when the boat was late and then they sent the wrong boat to the dock. The delays surpassed 30 minutes, but thankfully our guide he told us to call him John the Baptist yelled at the boat operators and got them to shave off 15 minutes of the boat ride without us missing any of it. We got back to our hotel by 12pm as was promised. Thanks John! 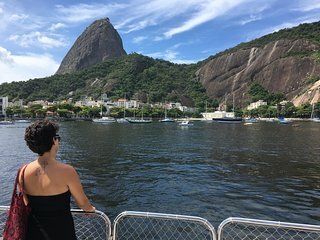 As for actual sightseeing, it's a nice way to either start or finish your time in Rio as you'll get a different perspective of all the landmarks and see areas you wouldn't get to otherwise. The live English commentary on the boat was also very helpful along with the fun Bossa Nova music in the background.